One Sunday night Victor Fernandes was watching “Extreme Makeover: Home Edition” with his family and said he would love to contribute to a show like that. A few weeks later, out of the blue, his business, Fernandes Masonry Inc. got a phone call. A general contractor working with the show—which surprises people by renovating their homes—wanted his help doing a home makeover. Fernandes jumped at the chance, as the business had often done charity work but none of it this high profile. And so, during a snowy, New England cold snap that winter, Fernandes Masonry worked with “Extreme Makeover: Home Edition” to install stone on the front of the house, lay driveway pavers, landscape the yard and place the stonework on the interior fireplace. The business even got called back to assist another contractor who was falling behind. This experience, says Fernandes, is just one small example of what makes his company unusual. Not only is Fernandes Masonry family run and committed to quality work, it has extensively given back to the community in Massachusetts, where it operates. Fernandes Masonry Inc. is a masonry construction company that Victor Fernandes and his three brothers—David, Juliãõ and Joe Fernandes—started 20 years ago in New Bedford, Massachusetts. Two decades later, the brothers are inseparable. When the four of them go to lunch on the weekends, Fernandes’ wife asks why they need to spend any more time together, but that’s how the Fernandes brothers were raised. They value family and hard work above all else, and those values show in the success of their business. In 2015, Fernandes Masonry completed its largest job yet, $7-million-worth of masonry at a brand new high school in Franklin, Massachusetts. Fernandes Masonry did all of the masonry for that 300,000-square-foot project, which included a three-story brick classroom structure, a large outdoor courtyard, and an adjoining gymnasium and auditorium. 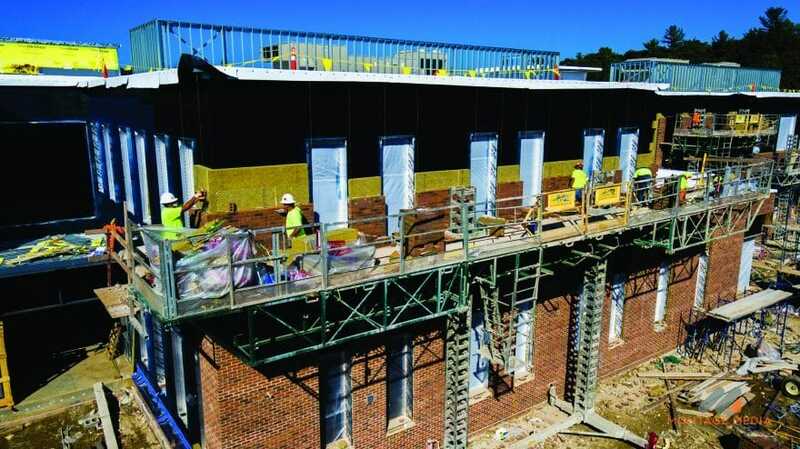 Last year, the company was busy at work on a $3.6 million masonry job on a new city square in Bedford, Connecticut and another $3.8 million-worth of masonry for Scituate High School in Scituate, Massachusetts. Working closely with its clients helps Fernandes Masonry deliver that high quality work. Today Fernandes loves masonry, but it wasn’t his first choice career. “I was basically forced in,” he says, laughing. When the Fernandes family emigrated from Portugal, the three older brothers and their father went into masonry construction. Victor Fernandes wanted to be a mechanic, but that didn’t pay as well as masonry, and he decided to join his brothers doing masonry. After working for other companies for years, the four Fernandes brothers started their own business in 1997. Fernandes Masonry offers an apprenticeship program through the State of Massachusetts to help bring new laborers into the industry. Apprentices work full-time for Fernandes Masonry while taking safety and technical courses, and almost all of them continue to work with the company after they graduate. At least 80 of Fernandes Masonry’s 100-plus employees have been with the company for five or more years. Not all of Fernandes Masonry’s charitable work is as high profile as the “Extreme Makeover: Home Edition” show. Three years ago Fernandes created a nonprofit, Team Noah Foundation, in honor of his son Noah who was diagnosed with a degenerative disease at 5-years-old. The goal of the foundation is to improve the quality of life of children with disabilities and their families by installing wheelchair-accessible ramps, bathrooms and driveways at no cost to the families. In 2013, Team Noah Foundation, two other charitable organizations—Cameron’s Kids and TJA Fund— and community members and leaders learned that a local woman was taking care of her two young grandchildren, one of whom had severe special needs. At first they came together to get the woman a washer and a dryer, but that idea quickly evolved into a community-led extreme home makeover that they called The Jeremiah Project. The Jeremiah Project team sent the woman and her grandkids on vacation. While she was away, the team doubled the size of her house, made it fully wheelchair accessible, landscaped the yard and provided everything from new appliances to new furniture, alarms and sprinklers. The Jeremiah Project team also provided her with a large cash donation to help pay future bills. Now Team Noah Foundation is building a $1.3 million, fully wheelchair-accessible playground in New Bedford, Massachusetts. That playground, built in Noah Fernandes’ name, will include a merry-go-round and swings that children in wheelchairs will be able to use. Fernandes Masonry’s employees and industry contacts—carpenters, plumbers, and electricians—are contributing to this and other Team Noah work. The local community has contributed tremendously to the Team Noah success and has helped raise funds to make this park a reality, Fernandes says.